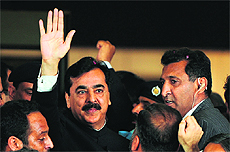 The Pakistan Supreme Court on Tuesday declared that Prime Minister Yousuf Raza Gilani stood disqualified since April 26 and ceased to be the premier since that date. With an important NDA partner Shiv Sena today declaring support for UPA presidential candidate Pranab Mukherjee and another key ally JD(U) showing signs of doing the same, an embarrassed BJP has been left with little option but to back former Lok Sabha Speaker PA Sangma in the presidential election. The budget of the SAD-BJP alliance to be presented tomorrow is expected to be a lacklustre affair. Finance Minister Parminder Singh Dhindsa is neither likely to impose any new taxes nor is he preparing to give any major relief. The state government is likely to step down from the promises made by it in the manifesto prior to the Assembly elections earlier this year. After a brief lull, Pakistan Rangers violated the ceasefire for the fifth time since June 13 targeting Indian forward posts along the Line of Control (LoC) in the KG sector of Poonch district today morning. No troops were injured. Pakistani troops targeted Indian posts with small and medium arms. Official sources said that firing lasted for nearly an hour. Though they did not make much headway at their two-day talks on the Sir Creek issue, the delegations of both India and Pakistan today expressed confidence that they could resolve the maritime dispute given the current state of relationship between the two countries. A meeting of the Joint Parliamentary Committee (JPC) looking into the 2G Spectrum scam ended amid high drama with a full blown political battle between the Congress-led UPA and the BJP-led NDA members on summoning Prime Minister Manmohan Singh and top PMO officials. Greek political parties meeting on Tuesday said they expected to form a coalition government soon and then seek concessions to the painful austerity measures tied to the international bailout deal keeping the country from bankruptcy. The Ministry of Youth Affairs and Sports today left it to the All India Tennis Association (AITA) to sort out the team selection controversy after a meeting with AITA officials, taking the plea that �the Sports Ministry is not part of the selection process�.